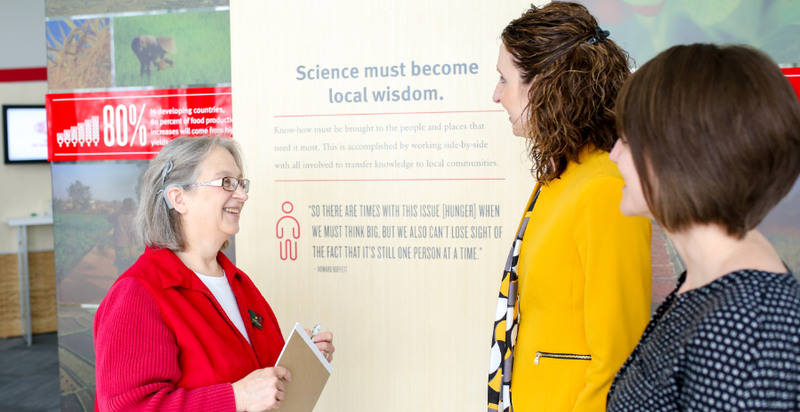 DuPont Pioneer Research Scientist Martha Meyer speaks with colleagues. An estimated 15-17 percent of the population has hearing loss. Many don’t wear hearing aids for fear of a stigma. Some gradually acquire hearing loss over time and don’t receive complete diagnoses until later in life. DuPont Pioneer Research Scientist Martha Meyer inherited her hearing loss. Meyer, who began wearing a hearing aid in her teens and received a cochlear implant in 2013, is very familiar with the challenges of living and working with hearing loss. She advocates for people with hearing loss in the workplace and in the community. As leader of the Iowa chapter of the Hearing Loss Association of America, Meyer has provided support and encouragement to other hard-of-hearing Iowans, advising on topics such as movie theater captioning, cochlear implants and coping strategies. At DuPont, Meyer educates colleagues about services, such as Communication Access Real-time Transcription (CART), that enable full participation of people with hearing loss. CART provides real-time captioning of live events. The text appears on a computer monitor or other display, enhancing understanding for people who are deaf, hard of hearing, non-native speakers of the language or just having trouble keeping up with the speaker. CART services are helpful to anyone who needs communication access, including those with different learning styles and those who may not be native speakers of the language being spoken. Meyer notes that meeting organizers should emphasize that all speakers, including the audience, must use the microphones. Microphones serve multiple purposes. They amplify sounds and assist those who have hearing loss as well as enabling CART transcribers to hear everything that is being said and transcribe the corresponding words.